NCRAA26: UL d. Pasig Catholic, 85-73 | Servinio's Sports Etc. How sports should be written! UL Golden Tigers are playoff-bound in the 26th NCRAA! DAGUPAN CITY – Playing in front of their home fans for the first time this season, University of Luzon did not disappoint as they held of visiting Pasig Catholic College, 85-73, and claim the last quarterfinal slot of the 26th National Capital Region Athletic Association (NCRAA) Wednesday at the Dagupan City People’s Astrodome. Reynald Ballesteros put on a shooting clinic by scattering nine triples to key the Golden Tigers’ march into the playoffs starting next Monday. Ballesteros fired four triples in the first period as UL pulled away early and never looked back, 25-12. Refusing to quit, the Crusaders slowly whittled at their 17-point deficit entering the fourth period, 50-67, with back to back baskets by Marc Lester Tamayo and Algie Chavenia putting them to within their closest at six markers with 2:56 on the clock, 70-76. Suddenly, Ballesteros’ ninth and final triple proved to be the dagger as it gave UL valuable breathing space at the two-minute warning, 79-72. That was more than enough as Mario Torio took over by scoring six points in the final minute against a lone Crusader free throw by Chavenia to seal the deal. Ballesteros finished with a total of 31 points. He was ably supported by Bryan Rosalin with 12 points. Tamayo did his best to carry the Crusaders with 23 points while Tristan Medina added 12. The team had to make do without the suspended duo of Lander Canon and Aaron de Guzman and top guard Gio Calacalsada playing with an illness. The Golden Tigers thus created a three-way tie with idle PATTS College of Aeronautics and De Ocampo Memorial College at 5-2. By virtue of the FIBA tiebreaker, UL (+5) earned the second seed while relegating PATTS (-2) and DOMC (-3) to third and fourth respectively. The Group B quarterfinals will now see undefeated top seed Centro Escolar University playing DOMC while UL battles PATTS. CEU and PATTS are the early favorites owing to their elimination round wins over their respective opponents. LUZON (85) – Ballesteros 31, Rosalin 12, Caasi 8, Torio 8, Quinto 7, Meneses 7, Main 6, Basan 3, Balolong 2, Dudan Cruz 1, Angcap 0. 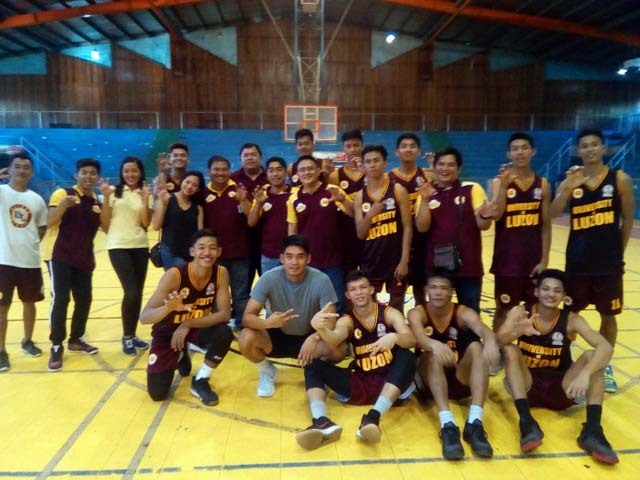 PASIG CATHOLIC (73) – Tamayo 23, Medina 11, Benedictos 9, Samonte 8, Salen 8, Chavenia 6,Calacalsada 6, Roxas 2, Ej Diana 0, Ey Diana 0, Latorre 0. Period Scores: 25-12, 43-27, 67-50, 85-73. A long-time television sportscaster, magazine writer, photographer and college professor from the Philippines finally gives blogging a try after more than a decade of on-line presence. Read on folks! This entry was posted in Basketball, NCRAA, Sports. Bookmark the permalink.